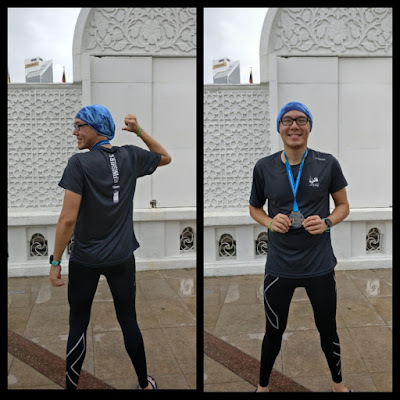 My First Full Marathon at Standard Chartered Kuala Lumpur Marathon 2017 | JustRunLah! Ticked off the bucket list of things to do before I die. I finally ran my first Full Marathon last Sunday (21/05/2017) at the Standard Chartered Kuala Lumpur Marathon 2017. Being my first FM, my target was to complete it under 5 hours. Was I being too ambitious? Maybe. I actually completed 42KM in 5:08:36, not bad for a virgin FM-er eh? However, my GPS watch tracked 43.17KM in 5:06:56. According to my friend, our GPS watch is slightly inaccurate as some parts of the course are not tracked by the GPS. 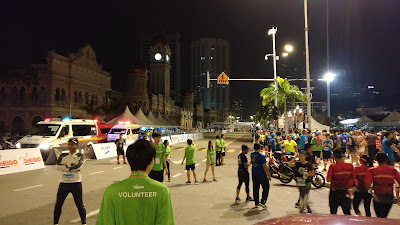 I was supposed to have 2 others running kakis to run FM with me this year but they missed the registration date. Slots were sold out so quickly this year! Despite me reminding them to sign up every now and then, they still missed it 😠. We were past participants for the previous year so we had the opportunity to pre-register before the slots opened. 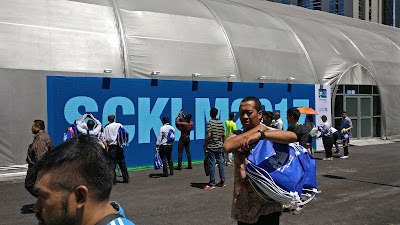 Anyway, went to collect my racepack on Thursday afternoon at KLCC, supposedly less people since it’s the first day for collection and it was in the afternoon. Last year the racepack collection was at another place and the wall of names were indoor. I looked for my name but failed, only to find out later it was for Full Marathon participants only. I only took part in the HM the previous year. 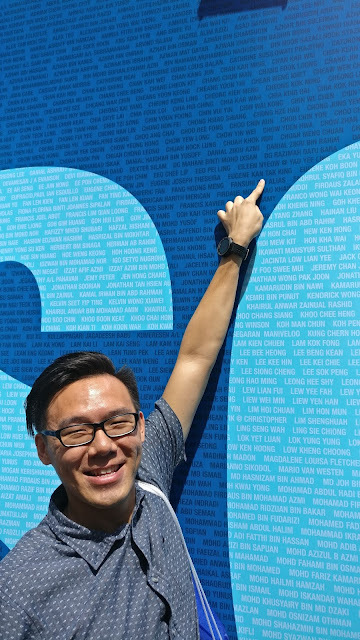 so that kind of motivated me to take part in the FM, I want to see my name on the board! 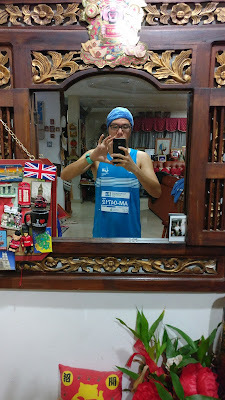 Went home, unpacked the racepack (contained the usual freebies: GP batteries, Salonpas sticker, SCKLM towel, bib, and jersey) and got everything ready by the bedside. 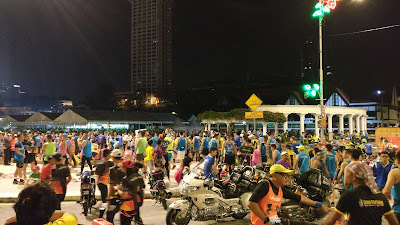 Tried to sleep very hard at 10pm but failed, kept tossing around; butterflies in the stomach; couldn’t stop thinking of the articles, tips and advises on running. It felt like I was sitting for an exam the next day! Woke up at 1am to have “breakfast” – two slices,combs bananas, some bread and white offee. Tried to release a big one but only did a number 1. Took the LRT to Masjid Jamek. Complementary ride courtesy of SCKLM. 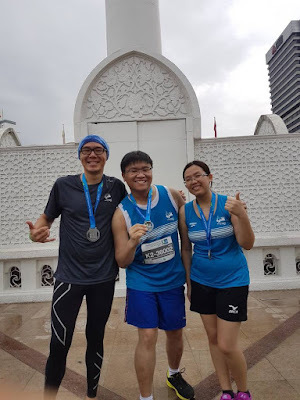 Was lucky since the station I boarded the LRT at was one of the chosen stations to ferry SCKLM participants to race venue, happens to be just behind my house (O thank you Running God!). After 45 minutes and multiple stops, finally reached the station. Followed the crowd to the race venue. Went straight to baggage drop as it was half hour away from flag off. Annoyed to see such a long line, waited at least 20 minutes until bag was safely deposited, which means I have only 10 minutes to warm up and get to the starting pen. Tried pinning my energy gels(2 packs) onto my jersey/pants but failed, pin was too small and fragile, held them in my palms instead. Stereo was blasting boom boom pow by Black Eyed Peas to keep the runners pumped up; announcer initiated the 10 seconds countdown, and soon we were off! I kept calm, started with a 7:30 pace. At times intimidated by faster runners who kept taking over me. KM8, as we passed by a hotel, a pretty lady passed by(supposedly just finished work) and one of the runners started cat calling and we all laughed. 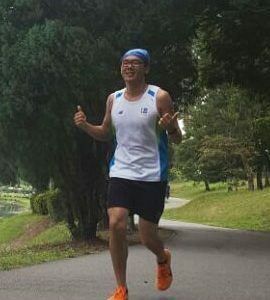 KM13, one runner tripped and fell. He quickly got up without any assistance and everybody started cheering and applauded. KM23, one female runner started clucking like a rooster. It was 6:50am and probably it was her bodies’ internal alarm clock telling her it’s time to wake up. Everybody just stared at her and thought she was out of her mind. KM30, we passed an arch with the words “run for a reason” and we were given these green colour wristbands with that tagline. Probably to separate runners who did actually pass the 30KM mark from those who did not. KM34, killer stretch at Jalan Tijani/Tuanku. I remember the street name because the houses mansions along this street are huge! The housing compound was huge and the houses was almost 3, 4, 5 stories high! Not to forget the slopes on this road too, longest and steepest slope. Didn’t stop running but just slowed down a little and pushed really hard. Can’t remember which part onwards but they started giving out these orange flavoured energy gel and I must say it was sooooooooo tasty! Read from the articles that we should never mix different running gels but it was the last 7KM or so and decided to just wing it. KM39, legs started feeling really pain, lucky no cramps but hamstrings were definitely feeling uncomfortable. If I pushed any harder, confirm will cramp. Along the way I only stopped at water stations to drink and never stopped mid-run. I consumed the water / isotonic drink, threw the cups into the bin, chilled for 5 seconds, and off I went! KM41, only 1km left and was struggling. Kept on pushing and weaved pass runners from the other categories. Was panting hard and my hands were doing this cycling motion, somehow helped me to continue pushing. THIS WAS THE LONGEST 1KM OF MY LIFE! Finally, I have completed 42KM. Tried to smile and pose for the cameras at the finishing line knowing my face will still turn out like S**T.
Also, it started raining after that. Thank you Rain God for letting me cross the finishing line before finally pouring. 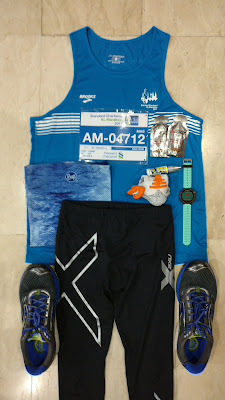 Collected my finisher medal, shirt and goodies. Walked really slowly under the rain to baggage claim area. Waited in the long and never-ending line for almost half hour before managing to collect baggage. I hope the organisers can improve this, baggage claim was such a hassle! Saw that I had 7 missed calls from my friends, they took part in the 10KM category and were waiting for me. Met up with them near the iconic flag pole at Dataran Merdeka. Took some pictures and then we went for breakfast at Chee Chiong Gai (Petaling Street China Town). I will be preparing for my next FM in November for the Penang Bridge International Marathon 2017. In between, I have also taken part in all 3 of The Performance Series Malaysia runs(21KM of course) and will tell you about it soon. Until then, happy running! Sorry for the late reply, good luck and enjoy the run! Aww, hope you get well soon. All the best!